Whoopi and Maya have been building their medical marijuana startup for women for the past year and a half. Whoopi is getting into the weed business. Actress and comedian Whoopi Goldberg is the cofounder of a new medicinal marijuana startup that's geared toward providing relief for women during that time of the month. The company is called Whoopi & Maya, after Goldberg and her cofounder Maya Elisabeth, who's been running medical marijuana company Om Edibles since 2008. The women are launching four products to help relieve period cramps and discomfort. Sort of a "menstrual survival kit," the products range from edibles, tinctures or liquid extracts, rubs and a bath soak. All are infused with cannabis. From bathtime to snacktime, Whoopi & Maya is a cannabis-infused survival kit for women. "This was all inspired by my own experience from a lifetime of difficult periods and the fact that cannabis was literally the only thing that gave me relief," Goldberg said in a press release. She has previously professed her love for pot, writing about her relationship with her vape pen for The Cannabist two years ago. Goldberg will serve as chairwoman of the startup, while Elisabeth, who is based in the Bay Area, will be CEO. Related: Cannabis: Israel's next big medical export? According to Elisabeth, the products are designed to be "discreet." The tincture, for instance, can be dropped into any beverage, or placed under the tongue. In the cacao, the cannabis flavor can't be tasted, said Elisabeth. These two products are psychoactive, meaning they may induce a marijuana high -- while the bath soak and rub are not. That doesn't mean the bath soak isn't without effect, said Elisabeth. "You'll be so relaxed, you'll just go straight to bed," she said. The items will be available for purchase at select dispensaries in California starting next month, although the retail prices aren't set yet. Medical or recreational marijuana is legal in 23 states and the District of Columbia. And it's a growing industry for entrepreneurs to cash in on. It was estimated to be worth $5.4 billion in 2015, according to ArcView Group. In the last quarter of 2015, there were 29 deals in the space -- a record for the marijuana industry, according to CB Insights. 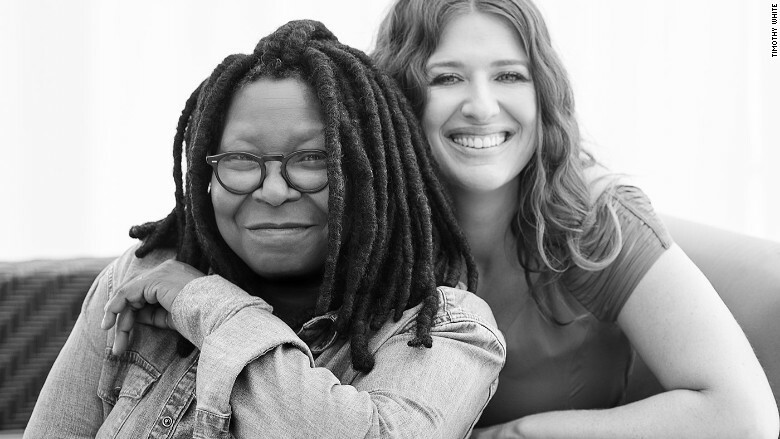 Whoopi & Maya has raised $650,000 in funding from friends and family. Elisabeth -- who met Goldberg a year and a half ago -- said the products aren't just for those with menstrual discomfort. "That's one of the things that's so beautiful about cannabis," said Elisabeth, noting that a lot of men have expressed interest in also using the products. "The side effects [of the products] are desirable."